With the pop punk scene becoming a conveyer belt over the past twenty years, regurgitating the same cheap teeny sound over and over, it makes it difficult to stand out from the crowd. However, with Better You & Me’s success of their stand-alone single Overthinking gaining over a million streams across Spotify and YouTube and recently completing tours in Australia with Trash Boat and Tonight Alive, they have definitely caused a stir in the pop punk world. Consisting of members Jake Wilson (vocals), Jai Gibson (guitar), Chris Bowerman (guitar), Jamey Bowerman (drums), and James Karagiozis (bass), the new album opens with the familiar fast tempo in Twice Shy with shouty vocals, heavy beats and bitter lyrics, the album appears to submit itself to the conventional guidelines of modern pop punk. Followed by Move On, the lyrics “I’m so sick of feeling alone” give a self-hating blast of relationship pain and heartbreak. Broken continues the struggle of emotions with a surge of desperation with the lyrics “Lately I feel like I’m sinking”. Up until this point, Everything Is Temporary ticks all the right boxes, causing it to fall into the depths of every pop punk band trying to find their way up to the top. However, Dakota brings depth to the album, taking the band back to being seventeen again, bringing a combination of frustration and sweet sentiment to the catchy lyrics acting as a conversation with a friend who never stood up to “the cheating, lies and the abuse” she was subjected to. Dakota will definitely be a favourite, with a chorus bursting with angry emotion ending with the line “If you ever need, I’ll always be here” to melt the hearts of the fans with its caring energy and emotion. Floral Glass and I Can’t Help It reverts back to the heartache and heavy lyrics resembling the vocals of Bring Me To The Horizon’s Oli Sykes, followed by the album’s title track Everything Is Temporary, offering a glimmer of hope through the darkness of personal anguish and heartache that overshadows this debut album (keep listening for the short piano piece at the end). It is clear that Between You & Me have a tendency to fall into the conventional bracket of modern pop punk, however, they show potential to move beyond the predictable pop punk sound, offering lyrical depth and emotion to a scene that has been white washed over the years. 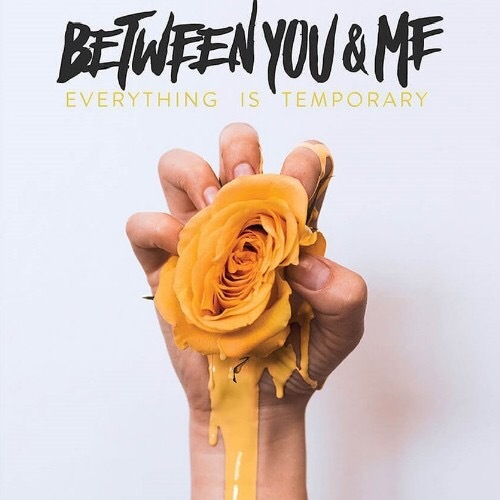 ‘Everything Is Temporary’ by Between You & Me is released on 29th June on Hopeless Records.